$160.07 Includes FREE Shipping in Continental U.S. If your refrigeration or air conditioning system fails such as a compressor burnout, the refrigeration system becomes polluted with extensive amounts of particulate waste as well as sludge, acids, carbon residues - even moisture. These all must be removed before the system can be restarted. That is where NuCalgon 4300-08 Rx11 comes in! It is also used after retrofits and has a patented HFC based solvent formula which is also ideal for flushing line sets for R-410A conversions. Rx11 is a non-poisonous, non-flammable, environmentally-friendly substance, and won't diminish the ozone. The starter kit contains 1 lb. canister, hose, gun, and valve. The canister flushes 3-4 tons.The 1 lb. can is available as a separate item, NuCalgon 4300-09 Flush 1 lb. 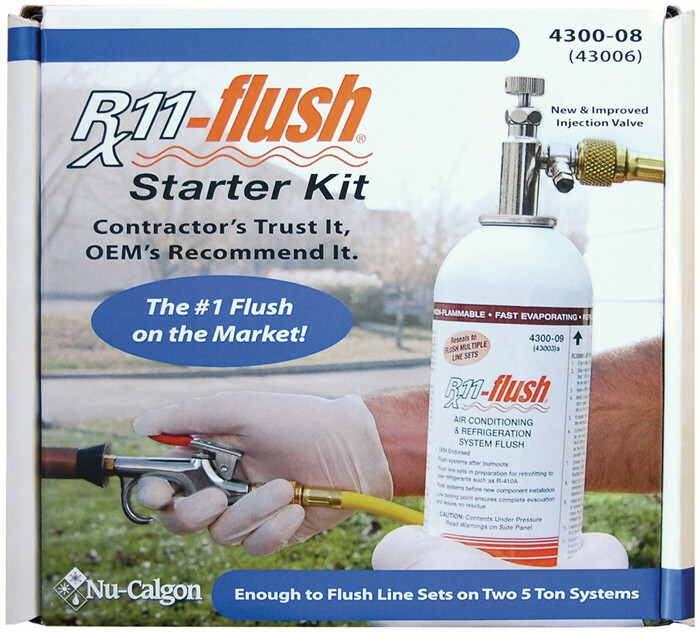 can.For larger systems, please see NuCalgon 4300-11, Flush 2 lb. canister which flushes 5-7 tons. Or buy in a convenient 2 pack - NuCalgon 4300-10. 2 - 2 lb. canisters and includes a valve. Click Here to contact our Sales Department.